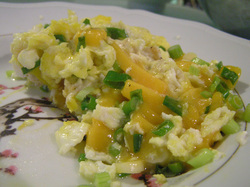 I love Scrambled Eggs at any time of the day. A quick nutritious tasty meal really hits the spot for me everytime. If there is something in the fridge it's almost always eggs. I hope you enjoy the following videos Scrambled Eggs The Desi Way i certainly did and i tried out the recipes mwah ! !